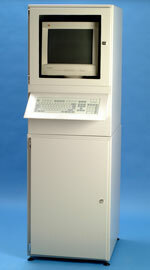 Computer enclosure for security and protection of computer hardware, sealed to IP54 or IP65. Computer enclosure security and protection of computer hardware, sealed to IP 54. 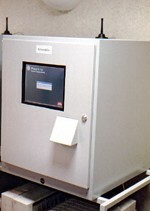 Enclosures are able to protect PC and computer hardware in industrial and commercial surroundings, that otherwise they wouldn't be able to work in. 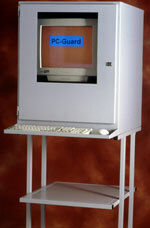 PC Guard has a range of products to suit many industrial and commercial applications ranging from standard enclosures to Industrial waterproof stainless steel computers sealed to IP65. Question: Why protect PC's in a factory? Protecting standard desktop PC's increases their usable life, reducing breakdowns, lost production thus providing a lower cost of ownership. When designing the enclosures we looked at what customers really needed and designed manufacturing cost out so that we could drive the price down, achieving a better price for you. More Info Please Contact PC Guard for more details. 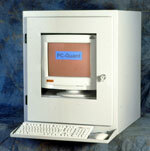 Contact Pc Guard for information on other enclosure products, optional extras or specials.